SUE Solutions successfully completed the subsurface utility engineering services (SUE) for this I-15 project located in Utah County, for the Utah Department of Transportation Region Three. The completed scope of work included both SUE Quality Level B and Quality Level A activities. This UDOT project is planned to include the addition of travel lanes in each direction of the I-15 corridor beginning at the SR-164 structure located in Benjamin, Utah, and ending at the I-15 and Utah Avenue structure located in Payson, Utah. As part of the SUE Quality Level B locating, survey, and CAD activities, SUE Solutions designated, surveyed, and processed into CAD all “known” and “locatable” existing utilities which crossed I-15. Utilities located as part of the tasks included culinary water, secondary water, both intermediate high pressure and high pressure natural gas pipelines, fiber optics, telephone, CATV, electrical (underground and aerial), sewer, and storm drain facilities. Approximately 8,700 feet of utility crossings were located, marked, and accounted for. 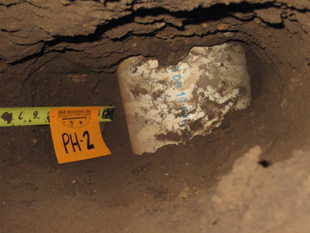 The SUE Quality Level A activities included the locating (potholing) of existing utilities at specific project conflict locations. SUE Solutions successfully completed ten (10) test holes, which included both culinary and secondary water, intermediate high pressure natural gas lines, and fiber optic facilities. 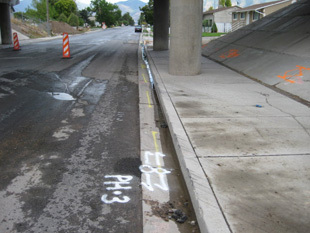 The final deliverable to UDOT was a comprehensive final report consisting of Quality Level B Exhibit mapping, Quality Level B photographs, Sewer and Storm Drain Data Sheets, Quality Level B Survey Data, existing Utility Owner mapping, Quality Level A Test Hole Data Sheets and photographs, and Quality Level A survey and CAD information.